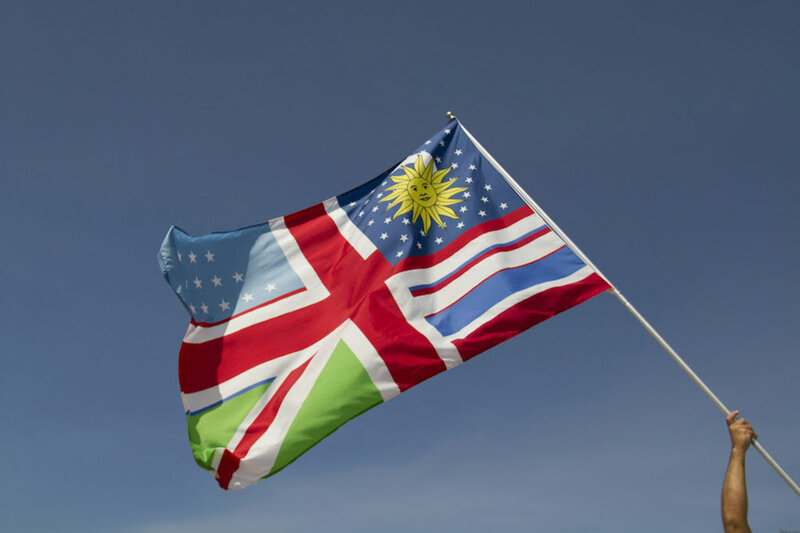 Image: Pedro Lasch, Abstract Nationalism: Composition 46/Flag Fusion (UK/US/Uruguay/Uzbekistan), 2001 – 2014. DiverseWorks is pleased to announce the opening of Lines Drawn, a project that explores how artists reimagine, disrupt, and question received notions of borders and boundaries. By addressing issues of immigration, nationalism, equity, and human rights through their work, the artists encourage us to contemplate the many barriers in our own lives as social constructions of power. Lines Drawn features the Justseeds/CultureStrike portfolio Migration Now! The opening reception is Friday, September 22, with a Members Preview and Curator & Artist Talk from 6 – 7 pm, and Public Opening from 7 – 9 pm. Lines Drawn is on view through November 18. Admission is free. Participating artists include Jorge Galván Flores & John Pluecker (Houston), Mariam Ghani (New York), Margaret Griffith (Los Angeles), Khaled Jarrar (Tucson), Pedro Lasch (Durham, NC), Phillip Pyle II (Houston), Henry G. Sanchez (Houston), Justseeds, and workshops, performances and public programs by Keelin Burrows & Travis Smith (in collaboration with the Printing Museum), Carrie Schneider (in collaboration with Arts Take Action Houston), Sara Uribe (in collaboration with John Pluecker), ZineFest Houston, and the Houston Cinema Arts Festival. The exhibition also includes a curated Zine Library with selections of activist zines from across North America. Lines Drawn is organized by Xandra Eden, Executive Director & Chief Curator, DiverseWorks. Please join us for a collective, choral reading of Antígona González (Les Figues Press, 2016) with author Sara Uribe, translator John Pluecker, and Houston-based women artists, writers, activists, and organizers. The reading will be in Spanish with projected translations in English. Antígona González tells the story of one woman’s search for the body of her brother who was disappeared in the midst of the on-going state and non-state violence associated with the war against drug trafficking in Mexico. The book interweaves this horrific narrative with those of other literary Antigones: from Sophocles to Griselda Gambaro’s Antígona furiosa, Leopoldo Marechal’s Antígona Vélez, María Zambrano’s La tumba de Antígona, and Judith Butler’s Antigone’s Claim. Copies of the book will be available for purchase. Organized by artist Carrie Schneider, this event invites artists to meet with activists for a rapid-fire brainstorming session to generate an abundance of ideas for creative tactics of changing public imagination, unsticking a stuck issue, and collaborative possibilities between artists and activists in Houston. Artists must pre-register for this event. Six issues undergoing major public debate in our city will be represented: Environmental Justice, Anti-Gentrification, LGBQTIA+ (SB6), Pro-Immigration, Criminal Justice Reform, and Black Lives Matter HTX Hurricane Harvey Relief. The overall goal is to offer new ideas to combat scarcity and burnout on the organizing side, and to link artists eager to plug in with political relevance. By collaborating with activists who are subject matter experts linked to Houston organizations, this event aims to offer creative contributions toward long term, politically effective strategies. We are NOT making signs, we are making new possibilities. Please register at Eventbrite. Presented in collaboraton with Arts Take Action Houston. This workshop will introduce 14 participants to the ways that printing has historically been used—and continues to be used—as a tool to affect social change. A brief history of empowerment through print will be presented at the beginning of the workshop. Participants will use a Showcard proof press and wood type from The Printing Museum’s permanent collection to create a two-color letterpress political poster (edition of 12) for public display and dissemination. Print to Empower is organized by Keelin Burrows, Curator of The Printing Museum, and Travis Smith, letterpress printer. FREE, but space is limited to 14 participants. Please apply on Eventbrite. Applications are due by October 2 with notification on October 3. Presented in collaboration with The Printing Museum. Join artists Maria-Elisa Heg, Stacy Kirages, and Sarah Welch of Zine Fest Houston for a Lines Drawn-themed zine-making workshop. This workshop will focus on DIY publishing techniques and the use of collage in zines. Basic supplies such as paper, pens, magazines, scissors, and glue sticks will be provided. Participants may bring optional materials such as personal writing or artwork, magazines, newspaper articles, photographs, etc. Refreshments provided. FREE, but space is limited. Please register at Eventbrite. Presented in collaboration with the Houston Cinema Arts Festival. Learn more about other HCAF screenings and events at www.hcaf17.org.